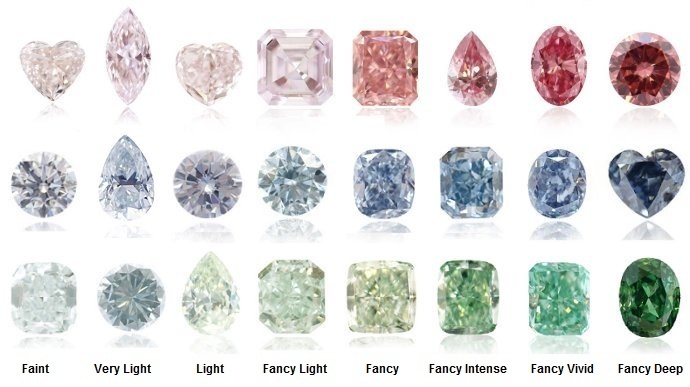 The color saturation, tone and hue of a diamond are by far the driving force behind valuations in the rare colored diamond market. This is dependent on how rare the color category is and how saturated the diamond is. Another point to consider is how bright or dark the reflection of the color in the stone is. The body color of a stone greatly affects the appearance of a diamond and its price. Color is part of the natural composition of the diamond and never changes over time. It is caused by varying quantities of nitrogen, hydrogen, boron or other trace elements present in rare colored diamonds, combining with the carbon atoms within the crystal’s structure. The GIA has a concise system for measuring the saturation, tone and hue to determine the grading level of each stone, utilizing several standardized tests on each stone to determine the color grade.